Masonry Toronto: If you are located in the Greater Toronto Area and are looking for a professional masonry contractor with years of experience and a track record of success, you have come to the right place. Cummins Restorations Inc. is a family owned company that has been operating in the area for over 20 years. We work closely with all of our clients to ensure that they are fully satisfied with the outcome of their project and are fully licensed and insured for all of the work that we do. We are equipped to handle requests for masonry & masonry repair services from both residential and commercial customers, having served hundreds of clients since we began in 1992. Some of our most notable clients include the late Ted Rogers, Starbucks, Bank of Nova Scotia and CIBC Bank. Initial Consultation – During which the goals of your project will be discussed as will your budget. On-Site Inspection- The only way to truly give an accurate assessment of the work that needs to be done is to inspect the site in person. Estimate Provided – Before any work is done, we will provide you with an accurate estimate, which you are not obliged to accept. Confirm Appointment – Providing you are happy with the quote, we will arrange an appointment for the work the be carried out at a time and date most convenient for you. Work Carried Out – You can rest assured that a skilled professional will arrive on time at your location, carry out the work required, and clean up afterwards. We complete every job as though we are carrying out the work at a friend or family member’s property and never compromise on quality. 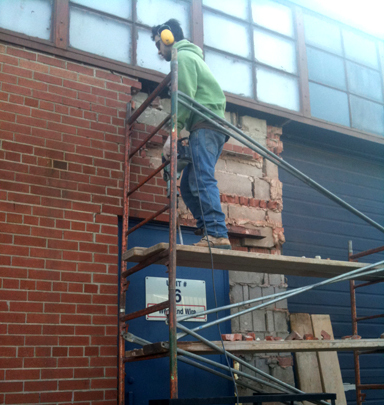 To see more Masonry Toronto services we offer such as masonry repair, or to arrange a free consultation, contact us today on (416) 992-7965.